Not only were the deeds of saints recorded in hagiographical sources; we regularly find traces of a local past as well. These traces can explain what elements of the past were important for a specific community. 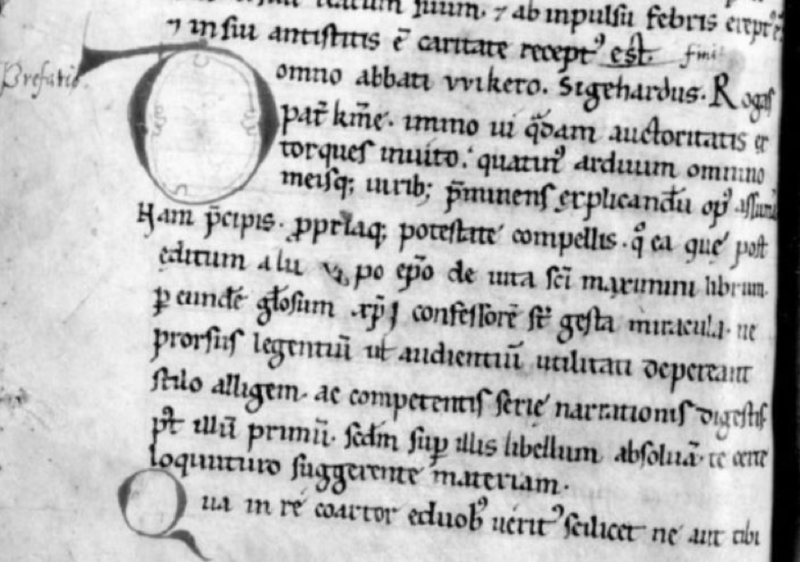 For example, in the following, I will argue that the Historia Miraculorum was written to justify a reform movement at the monastery of St Maximin in Trier, and that the author of the text used the past to frame the period before these reforms as one of great sin. A twelfth-century copy of the Historia Miraculorum, Paris, Bibliothèque nationale de France, lat. 9740, 112v. Image credit, Bibliotheque Nationale de France. Image in the Public Domain. The Historia Miraculorum is a hagiographical text written in the 960s by a monk called Sigehard. The protagonist of the work is the fourth-century archbishop of Trier, St Maximin. By the tenth century, St Maximin was patron of a powerful royal abbey in one of the three most influential metropoles of the Ottonian realm. The cult of the saint was already well-established in the Early Middle Ages, and St Maximin had been honoured with a vita from the eighth century. In this anonymous account of the life and miracles of St Maximin, the saint proved most miraculous after his death, performing healing miracles and expelling devils from beyond the grave. The most recent miracles recorded in this vita deal with Charles Martel and the court of Pippin, father of Charlemagne. Charles Martel had been ill with fever when St Maximin appeared to him in a dream, telling him to visit his sepulchre. When Charles was indeed healed at the shrine of St Maximin he decided to donate substantial property to the monastery. This narrative, as well as the healing of relatives of Pippin the Short, links the monastery of St Maximin with the early Carolingian dynasty. In the ninth-century reworking of the vita, written by Lupus of Ferrières, the changes were mostly stylistic, leaving the content unharmed. The Historia Miraculorum, written more than a century after this reworked life of St Maximin, is presented as a continuation of the vita, covering the miracles performed by the saint in the recent past, i.e. the ninth and tenth centuries. In this miracle collection, we are introduced to a very different side of the fourth-century archbishop of Trier. He does not restrict himself to healing the pious at his grave, but he now also punishes unjust rulers and protects his own property – in particular the property that was given by Charles Martel. This allows a unique glance at contemporary views of the recent past in the tenth century. The historical events that the author of the Historia Miraculorum pays most attention to are, firstly, the rule of lay abbots (853-934) and, secondly, the Viking raids of 882; please note that no further attention is given to the Carolingian dynasty. Either Sigehard was not interested in this period, as it was not necessary to make his point, or he did not know anything about it because the Viking raids of 882 had destroyed the sources about that period. The relationship between St Maximin and the lay abbots was not a positive one, if we are to believe the Historia Miraculorum. When Megingaud was appointed abbot of St Maximin, he suggested to his wife that he could use its wealth and property for his own gain. St Maximin punished him directly causing the abbot’s muscles to suddenly contract. Megingaud understood that he needed to repent for his sins and prayed at St Maximin’s crypt. Another abbot, called Gisilbert, was not so easily persuaded to apologise. He dismissed the wishes of the monks of St Maximin and distirbuted the possessions of the monastery amongst his vassels. The monks complained to the Ottonian king, Henry I, but the king was unable to do anything about the matter. Only when praying to their patron were the monks of St Maximin able to undo the tyranny of the lay abbot. This tells us either that the king was not very powerful, or that the abbot’s power was extremely far reaching. In either case, the patron saint was the only one to protect the lands of his own monastery from lay interference. This narrative gives an insight into the possible power struggles that occurred in the period. A second historical event that played a major role in the tenth-century narrative of the life of St Maximin are the Viking raids of 882. The Vikings had destroyed the entire city, including the monastery of St Maximin. In fact, according to the Historia Miraculorum, the Vikings had attacked so swiftly that there was no time to bring the relics of the patron saint to a place of safety. According to the Historia, the attacks of the Northmen had been a punishment from God. As the Viking raids occurred in the period of the lay abbots this can hardly be seen as a coincidental remark. Rather, it supported the idea that the late ninth century and the early tenth century was a period of sin. This great period of sin ended in 934, when the Gorze reform took hold of St Maximin’s monastery under abbot Ogo. Faith and morality had to be restored to the community. These reforms included liturgical innovations as well. It is no coincidence that many miracles in the Historia Miraculorum, written a generation after these reforms took place, are performed during the liturgy of the Mass or Office. In short, Sigehard used the recent past to justify these reforms. St Maximin had condemned the perversities of lay abbots, and God was not pleased with the people either, so He sent the Vikings. The message Sigehard wanted to communicate was clear, and the past was used to get it across.